Really beautiful looking loaf, Syd, both crust and crumb! Very interesting you added semolina in the formula? Is it semolina flour you used or regular semolina (grainy type) you'd use for making pudding? How did it affect to the behaviour/feel of the dough and also to the flavour/texture of the resultant bread? Thanks, Lumos. It is semolina rimacinata (twice milled semolina) so it is quite fine but still grainy. Not powdery like regular flour. Actually, it didn't affect the feel of the dough too noticeably. It kneaded like my regular formula (for my 'go to loaf') which is the same formula without the semolina and all-purpose. I only added them because I had to put something in to make up the difference for the shortage of bread flour. I think it definitely added to the flavour. Semolina breads or breads with a significant amount of semolina in them have a special flavour which I find hard to describe, but I find the taste very appealing. Lovely, Syd! The bread looks beautiful inside out. your display of the load is also unique. You're welcome, Varda. Drape a scarf and photograph some shattered shards on the cutting board. Now that's an idea. :) That's one of my standard scoring patterns but with so many slashes you have to make sure that it is slightly under proved otherwise they won't all open. See above pic. Lovely, Syd. Would you mind if I featured this one on the home page for a bit? Thanks, Floyd. I would be honored. Really nice open crumb. I can almost taste it. Excellent creativity, using what you have on hand. and creative with the flour use. Nicely written. Syd, looks like I'm late to the party...I've just been running around so lately..had to buy new washer and dryer. Congratulations on a lovely front page display. have to tell you, I'll make it short:) Went back next day to change to models with steam. Got over 300 in upgraded models for 70 dollars..glad I went back for upgrades and a day of special discounts! Hope these last as long as the last ones..20yrs..my dryer still works fine..but got the new matching set. Really nice to see one of your loaves on the front page Syd, and it's a beauty! 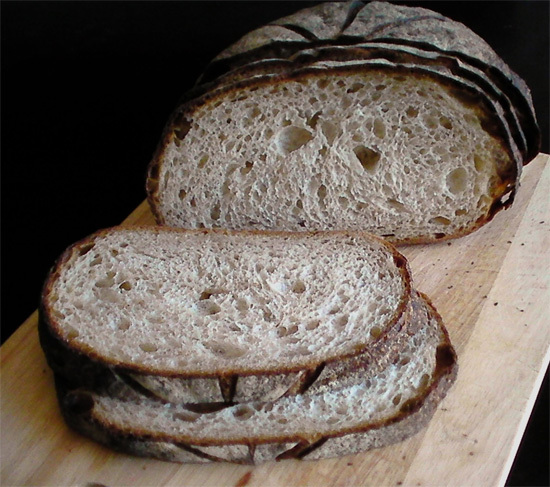 Terrific crumb and scoring, with a bold bake to maximize all the flavour from your well balanced formula. I can just imagine how good it tastes. Nice, Great baking Syd! Thanks, Franko. Yes, the bold bake really caramelises the crust and provides maximum flavour. It tasted really good on day three. Always good to hear from you, Franko. 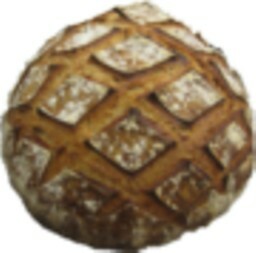 How nice to see your beautiful boule on the front page! 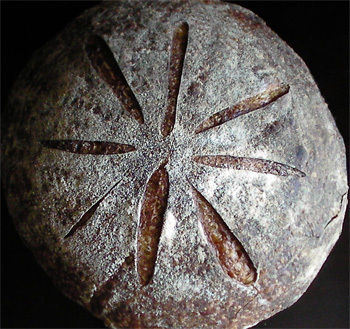 Gorgeous, dark crust and a very nice combination of flours. This recipe looked so good I decided to give it a try. I made a few minor adjustments to the flours -- more WW and rye (75g each), less semolina (50g), no AP -- and did a bulk ferment rather than after shaping (just because it's easier). I baked it last night and it looks and smells great. The past two days here were cool, so the ferment and rising took extra long. Got great oven spring, and a good looking loaf, although I had a blowout along a slash. Not a real crisp crust, so that would be something I'd work on for next time. (Did leave it in as the oven cooled; didn't seem to help.) I've had one taste, almost not enough to evaluate, but so far so good. Thanks for the recipe, Syd! You're welcome. The cool weather and subsequent long rising would have contributed to the flavour of your loaf. I wish I had the luxury of cool weather, but I don't so I have to rely on keeping my flours in the freezer, using chilled water, adding salt to my starter and retarding my loaves in the fridge. This is a 71.4% hydration loaf (if you include the water in the starter) so it requires some drying out to achieve a crisp crust. Perhaps, try and bake it for longer next time. Just check to see that you are not over browning it or burning it. At what internal loaf temperature do you pull the loaf from the oven please? I never test the internal temperature of my loaves. Perhaps I should. I am sure it would be quite informative. I suppose it is because I have been baking for so long that I have gotten used to when it is done. . But, if you wanted to test the temperature, it should be done when it is somewhere between 205 - 210F. I am not sure if there is any correlation between crisp crust and internal temp, though. What I am trying to say is that it might be cooked, but still retain enough moisture to soften the crust immediately you take it out of the oven. In that case you need to return it to the switched-off oven and let the remaining heat dry it out for a further 5 or so minutes. I tested mine, and it was 207F, which is a bit above where I was aiming (200-205F). But I basically agree with Syd, and think 200-210 is right for this loaf.